One of the newest markets on the block is also the most technological. 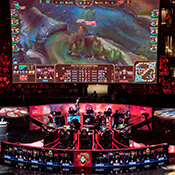 Esports take video gaming to the next level as pro players enter the virtual arena and compete against each other either as individuals or teams in mega tournaments like the League of Legends World Championship. Millions watch esports so if you think this is a fad, think again! Esports betting is here to stay so take a look at our odds and join the virtual revolution. BetStars News caught up with some of the best FIFA YouTubers in the world, AJ3, MattHDGamer, CapgunTom, Oakelfish and Finch to get their thoughts on the FIFA World Cup mode, what features they'd like to see added to the new game coming out later this year and some advice for EA Sports on engaging with their community.